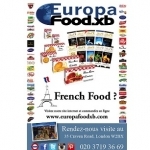 Europafood xb deliver French food and European food to your home and to local stores. Order online on their website at www.europafoodxb.com or come to the shop. Alternatively phone our head office on 020 3719 3696. Europa food xb offer a wide range of products: from fresh food (meat, vegetables and fruits) to baby milk, French magazines and pharmacy products.